Faithful readers of the writings of Mark Massa, S.J., will recall that his last book, The American Catholic Revolution, ended with a chapter titled “Things Change.” Massa picks up right where he left off in that volume at the start of the present work. The epigraph, citing Giuseppe Tomasi de Lampedusa, reads, “If we want everything to stay the same, everything has to change.” In this smart new text, Massa convinces the reader that this is infallibly true. Readers will not only learn a great deal while reading this book; they will also be entertained by the wit we have come to expect from Massa after his previous books on Catholicism in the United States. 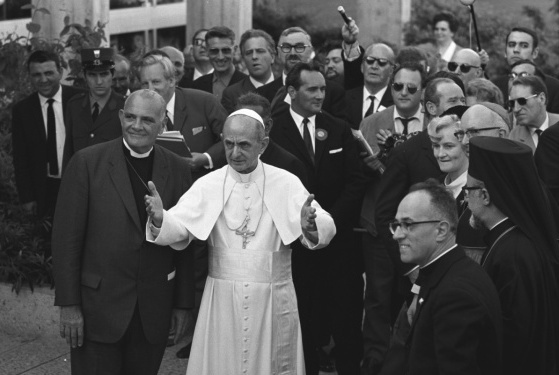 The release of this book coincides with the 50th anniversary of Paul VI’s promulgation of “Humanae Vitae” in 1968. Also in the background is the present moment in the American Catholic Church, which in at least one sense is like it was in 1968: Most Catholics believe that the church is incapable of changing. Thus, for instance, many Catholics voiced confusion when Pope Francis recently revised the Catechism of the Catholic Church to declare the death penalty “inadmissible” in all circumstances. In light of this present reality in Catholicism, this book could be illuminating for many parish reading groups, as it would ably demonstrate that revolutions in church teaching are not new. The Structure of Theological Revolutions is itself a revolution in a journey toward a fuller understanding of natural law discourse in the church. This book will also be useful for scholars and graduate students, especially those not already familiar with the historian of science Thomas S. Kuhn, author of The Structure of Scientific Revolutions. Massa provides a magisterial overview of Kuhn’s thought. This is important not only because theologians should learn from the natural and social sciences, but also because Kuhn’s model of paradigm shifts enlightens our contemporary Catholic life in the United States. Using Kuhn’s models to highlight the work of four of the most important Catholic thinkers of the 20th and 21st centuries—Charles Curran, Germain Grisez, Jean Porter and Lisa Sowle Cahill—Massa invites the reader to reconsider not only the church’s teaching on artificial birth control, but also the methodologies used to arrive at that teaching. This book is itself a revolution in a journey toward a fuller understanding of natural law discourse in the church. It does not disappoint. So what does the book tell us? If the 'church' has an Achilles heel, it is how it has understood natural law. And by tying itself into the Gordian knot, with specific theological assumptions, has also misunderstood the nature of Love and intimacy between a man and woman. For 'reason' cannot possibly comprehend the true nature of Love [or God for that matter] for reason, being the perfect emanation of the 'self' suffers from both a limitation and corruption of perception, that is innate to natural law and the evolutionary inheritance of our species. It is the transcendence or escape from that corruption which is the true revolution and the completion man as part of creation. A revelation that theology can never dream of comprehending. For those of us who aren’t faithful readers of Massa, what exactly can we expect to find in this book? This review leaves me with the impression that you didn’t actually read the book. I would expect more from a college professor. In fact, I expect more from my high school students. There’s not even a summary of the basic argument let alone a critical assessment of their merits. Also, it’s irresponsible to recommend this to parish reading groups when the main thesis (or at least the one that you highlight regarding the embracing of contraception) is contrary to the teachings of the Magisterium. As a historian of science who cut my teeth on Kuhn many years ago, I've been waiting to see someone successfully apply Kuhn's model of scientific change to theology. Hans Küng tried in 1989 with his conference volume on Paradigm Change in Theology. Küng focused on paradigms themselves and missed Kuhn's concern with the historical dynamic of how anomalies lead to crises which lead to revolutions / paradigm changes. Since the review is so brief, I guess I'll have to get the book to see whether Massa succeeded where Küng fell short. Charles Curran?? Wasn't he fired from Catholic University a long time ago? I think he was not teaching what the Church teaches. This article also appeared in print, under the headline "Start a revolution from my bed," in the October 1, 2018 issue. Daniel Cosacchi is the Canisius Postdoctoral Fellow and Lecturer of religious studies at Fairfield University. He is co-editor of The Berrigan Letters: Personal Correspondence between Daniel and Philip Berrigan (Orbis Books, 2016).